It’s so Simple… isn’t it? Anything but, it would seem. We have reports of many people failing to reach our phone numbers using the new 211 code for Lusaka, which seems to often result in a “number not in use” message. On speaking to an operator we are advised to try 1 instead of 211. It appears that old and new prefixes are running alongside each other and one or the other may work, or not. 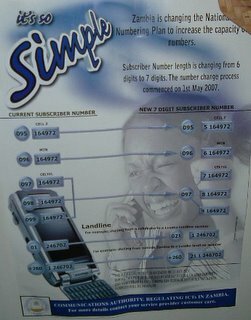 This official notice announcing changes beginning in May 2007 tells us that the Zambia code is still 260, but that the Lusaka land line code has gone from 1 to 211, when calling from outside of Zambia. In Zambia, the Lusaka land line prefix 01 has changed to 021. Mobile numbers are another story, as shown in the other entries. Recently I have managed to get through to Makeni using 1 for Lusaka on skype, but not using 211 by any means. Will the real Lusaka code please stand up! It seems to get increasingly less simple, but we are advised that the cut off for changes was November 2007. Perhaps they are behind schedule? Just try 1, or 211. One may work. This entry was posted in General news and tagged Lusaka, telephone. Bookmark the permalink. I now find that I also cannot ‘reply’ to messages on my mobile: the new numbers don’t work. I have to use old style numbers to get through to mobiles also.